Die Wohnung verfügt über 2 große Schlafzimmer, jedes mit eigenem Bad, ein großes Wohnzimmer und eine große und komfortable Küche. In der Küche finden Sie alles, was Sie für ein gutes Essen allein oder mit Freunden und Familie benötigen. Es gibt `s den Ofen als auch zum Kochen. 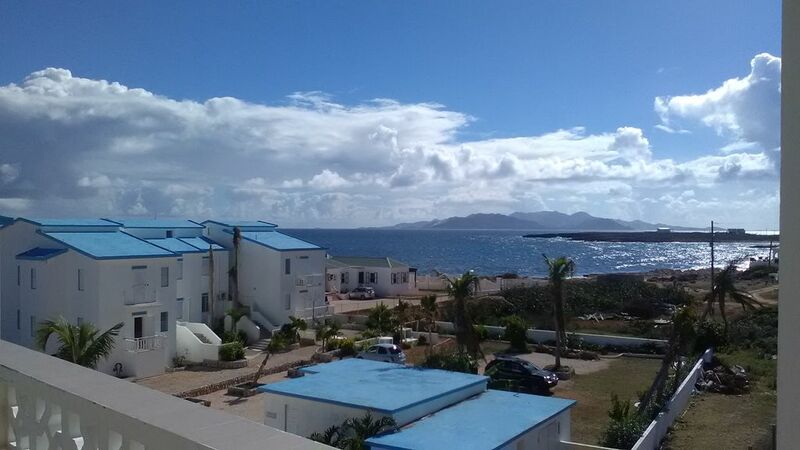 Der Balkon ist 200 Fuß breit und bietet einen atemberaubenden Blick auf den Ozean und die Insel St. Maarten, die Ihre Mahlzeiten und einen unvergesslichen Moment unvergesslich machen werden. Das Sonnendeck, 400 Meter breit, ist der perfekte Ort zum Sonnenbaden, Entspannen oder Sterne beobachten in den langen karibischen Nächten. Es wird auch von fließendem Wasser und Strom versorgt, mit einem Panoramablick auf die ganze Insel. Um Ihren Komfort zu verbessern, ist das Sonnendeck mit 3 Stühlen und 2 kleinen Tischen und 2 Strandkörben ausgestattet, um den sonnigen Tag zu genießen. Gleiche auf dem Balkon: bequeme Esstisch mit vier Stühlen und einem anderen gemütlichen Strandkorb. Kabel-TV und WLAN sind inbegriffen. Die Wohnung ist perfekt auch für ein paar Freunde dank der Privatsphäre, die von den zwei unabhängigen Zimmern, jedes mit eigenem Bad, garantiert wird. Die tägliche Reinigung ist auf Anfrage erhältlich. Sorgen Sie sich nicht um die frische Luft in den Räumen, denn jede Decke hat einen großen Ventilator. Darüber hinaus ist die Wohnung im obersten Stockwerk immer von einer karibischen Brise der Karibik gesegnet. Wir haben für Sie 1 Sonnenschirm, 2 Stühle und 1 tragbaren Kühler / Kühlschrank vorbereitet, um Ihre Zeit am Strand angenehmer zu gestalten. Wenn Sie möchten, gibt es die Möglichkeit, ein Auto zu einem günstigen Preis bei einem unserer Partner zu mieten (der Preis für die Autovermietung ist nicht im Gesamtpreis enthalten). Unser Manager unterstützt Sie beim Einchecken und Auschecken. Sie wird dafür sorgen, dass bei Ankunft und Abreise alles in Ordnung ist. Bitte betrachten Sie unser Anwesen als Ihr zweites Zuhause und behandeln Sie es als solches, damit der nächste Gast das gleiche unvergessliche Erlebnis erleben kann wie Sie. Wenn Sie etwas kaputt machen, müssen Sie es erstatten. Beide Bäder sind sehr groß und komfortabel. Toiletten und Duschen sind durch eine Wand eigentuemlichen. Beautiful, spacious, clean condo is great location. Owner was lovely to deal with and quick to respond. Highly recommend! Picturesque, quaint and quiet piece of Anguilla. We have visited Anguilla for 28 years and have stayed at many places around the island. Our Home Away stay in Sandy Hill was one of our favorites. Clean, tidy, friendly condo association on the sea with views of St Martin and a beautiful breeze made it hard to leave and go anywhere else. The unit was very well equipped, and porches and decks provide views of sunrises and sunsets. This felt like a bit of the laid back Anguilla of yesteryear. Will definitely stay here again!!! The apartment was ideal for our stay. It was clean and had everything we needed. Alcide and Angie were both very helpful and always available. Since it is on the upper level, the views and the breezes are amazing! We couldn’t believe the value once we saw how much indoor and outdoor space we had. Even better than the pictures. We had never been to Anguilla before, so we didn’t know what to expect. We already want to plan a return trip, and we will absolutely stay at Alcide’s place again. We had a great time at this beautiful location. This property is exactly how it is advertised. The apartment was spacious and the decks were a great place to enjoy shade or sun. Wifi worked very well. A secluded beach is only a short walk away. Anguilla has the best beaches I have ever seen and we had a great time exploring as many as we could in the week we were there. In the end I unfortunately could not personally make the trip, but all of the others were able to. Alcides apartment exceeded our expectations in every way. Check in was seamless. We arrived later than planned we were greeted by a neighbor who lived at the end of the driveway. She gave us a full tour of the apartment, beach, and grounds. It looks the apartments are Mediterranean villas transported to the Caribbean. The condos are secluded at the end of a long dirt path that leads to a breathtaking view of the water with rock sculptures and a private white sand beach with a mini coral reef. Crystal clear waters, and no one else around. The apartment was spacious for the four of us, and both bedrooms were equal size and their own bathroom. All very clean. The master has a private balcony separate from the one attached to the kitchen were we had our coffee, mimosas, and breakfast each morning. Both the balcony and roof deck are overwhelmingly beautiful and all you can hear are the ocean waves and breeze. We spent each morning and evening outside. In the evening took blankets up to watch the stars. Incredible!! Sleeping in this apartment with the windows and doors open (with screens) is the most peaceful experience as you hear the waves all night long and the cross breeze is AMAZING. No need for AC or the ceiling fans. It was really hard to leave, in fact we almost extended a couple extra nights but ended up heading to check out St. maarten instead. Will definitely be back for an extended stay!!!! My wife and I stayed one week with our 24 year old son. The unit was just as advertised and perfect for us. Angie and Alcide were very helpful and checked in on us periodically to make sure everything was OK. The covered balcony had great views for our morning coffee. We thought we would use the rooftop deck more but it was too windy so we did not use it much. The beach is an easy short walk and anytime we used the pool we were the only ones there. There are only 25 units in the complex and at most only half were occupied so the place is very quiet. The unit itself was nice and clean and came with enough towels so that we had no need to do laundry during the week. The kitchen was a small European style and certainly fine for breakfast but we would not want to cook there regularly. Since we were only there for a week and we did not get to all of the restaurants that we wanted as it was, this was not a problem for us. We will definitely stay at Sandy Hill Club again. Die Liegenschaft befindet sich auch in der Nähe von Saint James School of Medicine. If you wish to book for more than one week, ask us for long term rentals. OFFER FOR 1 MONTH ALL INCLUSIVE 3300 US, FOR 2 PERSONS MONTHS OF MAY JUNE JULY Payment: 25% at the reservation. The rest will be paid 20 days before the arrival. 3.5% bank fee for the payment with credit card Credit cards and checks are accepted. Check-in is from 4.30 pm till 6.30 pm and check-out is by 12.00 am. For the cancellation terms, ask at the moment of booking.